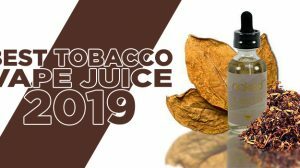 CueCig has many products that you would see on other sites, but when you purchase from them, you’re backed behind a nice sized company and a branding you can rely on. 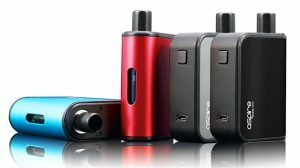 CueCig is one of the more commercialized company’s, yet they differ by not carrying one set in stone stick style electronic cigarette. 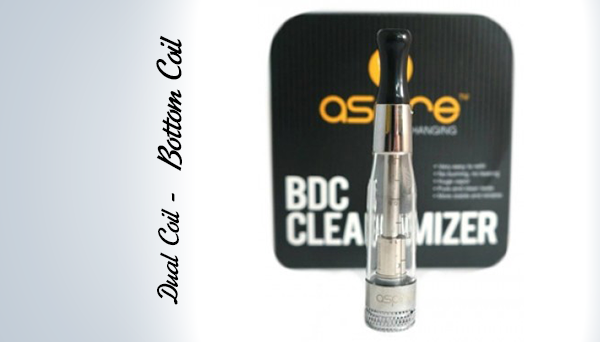 They offer many choices of ecigs, ranging from a mini to an advanced personal vaporizer. 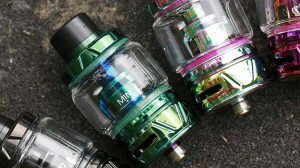 They also have many accessories such as tanks, atomizer, cartomizers and batteries. 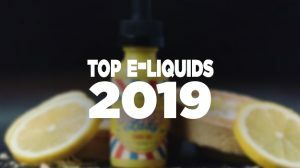 In addition, they have a nice line of e-liquid as well. The Cookie is a stick style e-cig or mini, but just slightly larger than the average. With its increased size, the battery is 400mAh, which should last you about a half a day or more, depending on how much it’s used. For some of you more new vapers, the Cookie should last you close to all day before needing a charge. The Cookie uses a pin style atomizer and makes use of its own e-liquid tank. The Cookie looks like a mini ecig, yet it’s slightly larger in size and it doesn’t sport your typical colored LED light at the end. It doesn’t fall into the line of looking like a traditional cigarette, it was more so aimed at looking like what it is, an electronic cigarette. The complete device is metallic brown except for the very bottom, a chrome cap with the “JustFog” branding. Starting from the top, there is a brown flat top mouth piece that sits onto the e-liquid tank. Below that is the atomizer body that uses a 510 threading. Below the atomizer, of course is the battery. At the top of the battery there is a fire/power button with one small LED light to its right and three small LED lights below it. 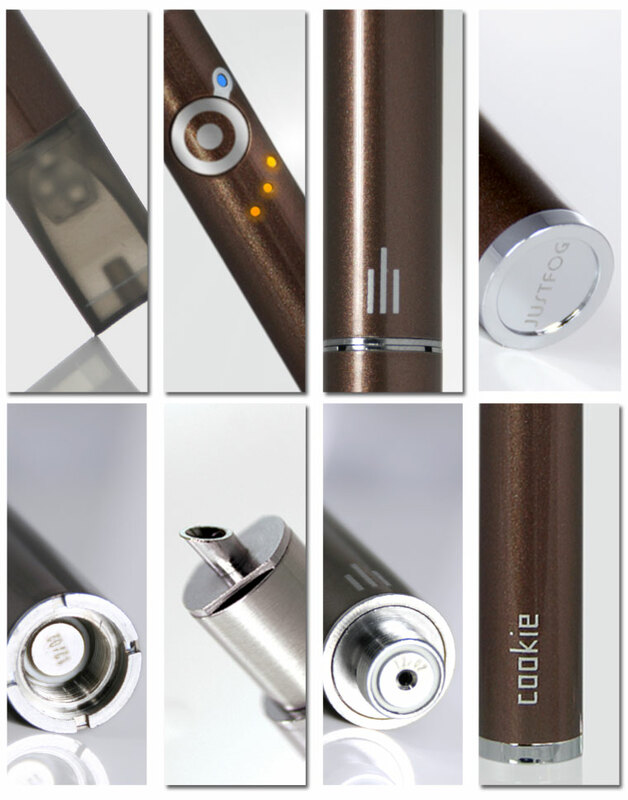 More towards the bottom of the device reads the name of the ecig “Cookie”. The Cookie Ecig vapes very well, a small size and looks great, but with like any other review, I’m going to be picky. The Cookie puts out a good amount of vapor and I really like that it uses the pin style atomizer – However, the mouth piece is what really erks me. I don’t like that the mouth piece is a flat top (just personal preference), and when inserting the mouth piece into the atomizer body, it was a bit tight and scraped some of the plastic. With that said, every time I insert the mouth piece, it doesn’t go all the way in. However, I may have put the mouth piece in crooked possibly, because the second mouth piece slides into the atomizer just fine. The plastic is very thin though, so either way, be careful. 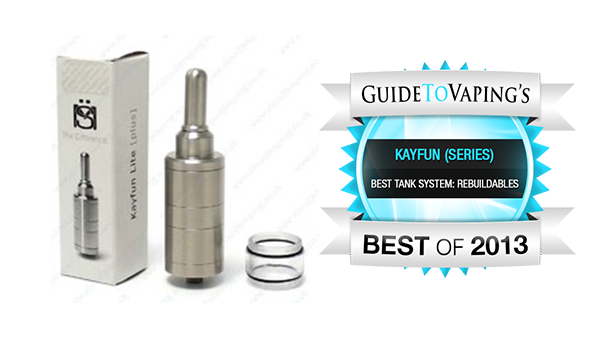 The E-Liquid tank is a style that I like and common when using a pin style atomizer. 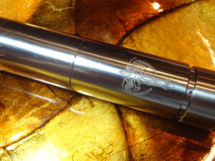 The pin style atomizers are quite nice – I found them to put out a very good amount of vaper, especially in use with these low voltage stick style batteries. The airflow design with the Cookie is perfect and works great for producing huge amounts of vapor. 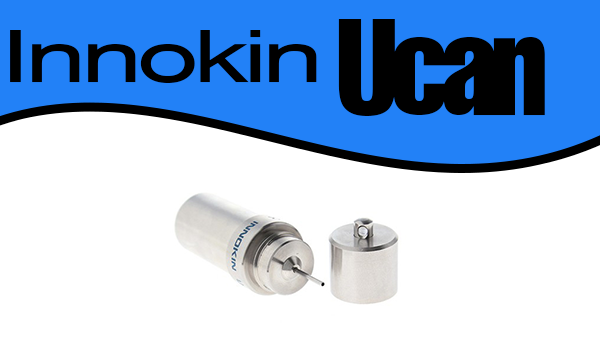 Filling the tank is very simple and is perfect for new vapers. 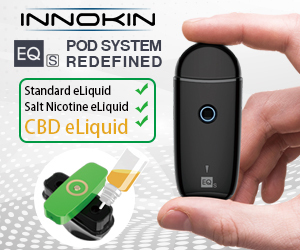 The battery is said to have ‘e-liquid protection’ on the battery, and that’s a good thing because e-liquid was flowing through the atomizer and onto the battery connection. I’ve done a lot of fiddling with the atomizer, taking it on and off and pulling the tank in and out, so this issue may be user error as well. The “Magic” Balls – This glass ball idea wasn’t a bad one at all. I like the concept, but they don’t seem to make much of a difference to me personally. I’ve vaped with all of them in the tank and vaped without any, and I seen no significant difference in liquid flow. They may have a purpose, but for me personally, I don’t see it. The Button has a slight clickyness, performs instantly with each click and seems to have a light paint coating over the top for added eye candy. Included with the eye candy is the lights by the button. The lights aren’t for just show purposes, they’re used for indicating battery life. The 3 yellow lights are on when fully charged, and as you use the Cookie and the battery depletes, each light will turn off in stages. The blue light above and to the right of the button indicates when the battery is delivering power to the atomizer or when the button is pressed. The Cookie Ecig performs well, looks great and is a perfect size. I like the fact that the Cookie uses a pin style atomizer, because I’ve had nothing but good experiences with them and they seem to last longer than your average atomizer. The airflow was great and helped produce a lot of vapor, but the magic balls didn’t seem to make any magic happen. However, the tank itself works great and holds a decent amount of e-liquid to hold over a new vaper almost all day.